Numbered 1-500 for service control. Perforated for customer claim check. Reverse side may be stamped with company name, phone numbers and service hours. 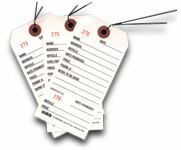 500 Service Tags per carton.